LOS ANGELES—Runic Films and Blue Seraph Productions are proud to release their highly anticipated trailer for their short Western epic, Cowboy Creed. ‘Cowboy Creed’ Official Trailer watch it in HD on Vimeo. The period short film stars Kendall Wells, John Carrigan, Tara Platt, and Anthony De Longis with Doug Drexler, Leandro Cano, and Wayne Webb. 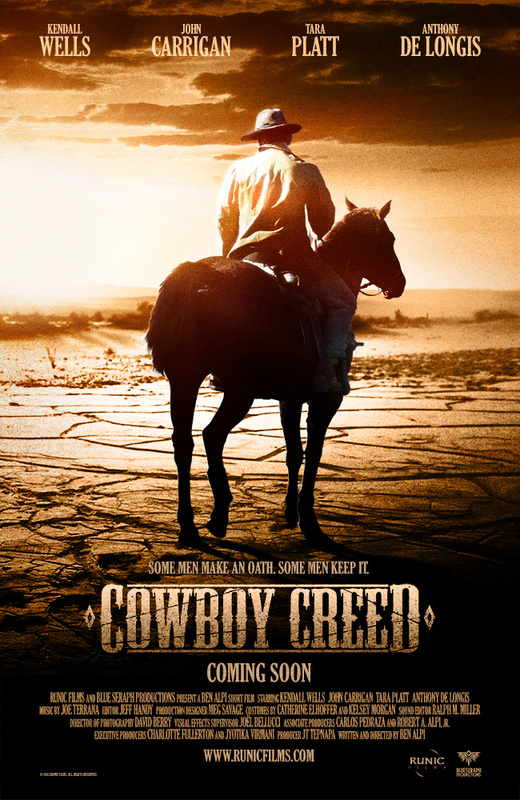 Directed and written by Ben Alpi, Cowboy Creed tells the story of Phineas (Wells), a young man who must face the most harrowing showdown of his life when the international criminal “Limey” (Carrigan) kidnaps his ladylove Miss Graves (Platt). The trailer will feature rich original music composed and performed by Joe Terrana and textured sound design by Ralph Miller. The film is produced by JT Tepnapa with cinematography by David Berry. Also released today was their first official poster featuring artwork by Scott Deyett of inHouse Graphics. Principal photography was completed in December and is currently in post-production bringing together composer Terrana and visual effects wizard Joël Bellucci. Runic Films is an Los Angeles-based film production and entertainment company dedicated to upholding the traditions of mythic storytelling. Blue Seraph Productions is a Los Angeles production company. Their previous work has been featured in the New York Times, BBC, Variety, Frontiers, Fab magazine, the Today Show, MSNBC, and other international news outlets. 3 Responses to ‘Cowboy Creed’ Trailer Released! Looking action-packed & very interesting! Go!! The trailer does not disappoint. As expected from an assembled cast such as this, both in front and behind the camera, the film will deliver in terms of action, tension, emotion and the expectation of good overcoming evil. John Carrigan does look menacing as ‘Limey’ and shows good form in the fight sequences. The finished film is eagerly awaited. Well done everyone. Yikes…John Carrigan certainly packs a punch! pun intended. Looking forward to its release.